Running a successful blog does not end by hitting the publish button. No matter how awesome your content is, your blog post will not get noticed unless you promote it like hell. Social media are powerful sources to reach out to your target audience, get more potential readers and drive more traffic to your blog. So, whenever you publish a new blog post, don't just wait for people to find your post, but actively share and cross-promote your post on multiple social networks and other blogging communities. Sharing your post manually is the best option. It allows you to add a personal touch to each post, as opposed to just blasting out the same message to all of your social channels. But, sharing your posts manually is also a tedious and time-consuming process. Some days, you may simply just run out of time to share your new content manually, especially if you publish regularly and post to more networks than just Facebook and Twitter. This is why you might think about automatic sharing, which will make your task not only easier, but much faster and more convenient. However, there are pros and cons of automation and there are certain rules you should stick to in order to make your automation strategy a success for your content. Here is what I use to get the time-consuming work minimized. In this article, I will show you how to submit posts with as minimal work and as much automation as possible to receive the most optimal output. Cross-promote: Why tailored posts get more likes? There are several tools for automatic cross-posting, but most tools just push the same post to all networks. They don't allow you to take full control of the output for each network. Just blasting out your post to all networks might prove not to have the desired effect. Successful social media posts are personal and engaging to encourage followers to comment, like and share your content. One of the strongest points against cross-posting is that each platform provides different options for presenting your posts. The networks allow different numbers of characters for your posting text and comments, different image sizes and some provide options for adding #hashtags and @handles. And, every network community reacts differently to specific formats. Whereas hashtags on Twitter and Instagram encourage more engagement, hashtags on Facebook get less engagement than postings without. On Facebook followers prefer short comments, long comments work better on Google+. So, a sharing tool should allow you to customize your posts for each network appropriately. Whenever you share a post, only a fraction of your followers will actually see your post. Every network has its own rush hour for involvement and engagement. By auto-posting your posts to all networks at the same time, your post may just go down in the endless stream of social media noise. Sharing your post at the best time to post on each network will be crucial for your post to be noticed. WordPress allows you to schedule your posts to be published on a certain day and time. That is very convenient for better planning your posts when you find time to write and to publish, whenever it is the best time to get the words out. What if sharing your posts to social media was just as easy? Wouldn't it be nice if there was a way to automatically schedule and share your WordPress posts to social media whenever it's the best time to post? There is. I will show you how to auto-share and auto-schedule your blog posts in the optimum format and at the very best time to post on each of your social channels. Twitter, Facebook (profiles, pages, gorups), Google+ (profiles, pages, groups), LinkedIn (profiles, pages), XING (profiles, pages, groups), Instagram, Flickr, Pinterest, Tumblr, Medium, Torial, Reddit, Diigo and Delicious. The plugin turns your post automatically into the optimum format for each network, with pre-filled excerpts of your post according to the allowed numbers of characters for each network. You can auto-submit your posts for immediate publishing with just one click, but you can also customize and schedule your posts for each network almost just as easy. However, I personally prefer to customize my post and I would recommend to take this one more step to tailor your posts before you press the "Share" button. In my experience, customizing the posts gives your post just the individual touch it needs to get more engagement. Blog2Social makes the customizing process quite easy. You can see all of your posts for all your connected networks on a one page preview. The editing fields allow you to add or remove the prefilled text, add personal comments, hashtags or handles. 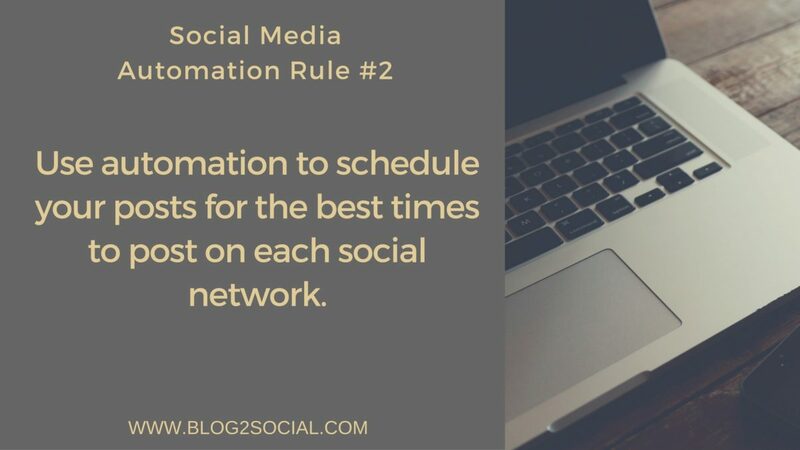 You can schedule your automatically by activating the pre-defined Best Time Scheduler, or you can define and save your own time settings for your posts to be sent to the different networks, for all networks, for each network, once or on a recurring basis. 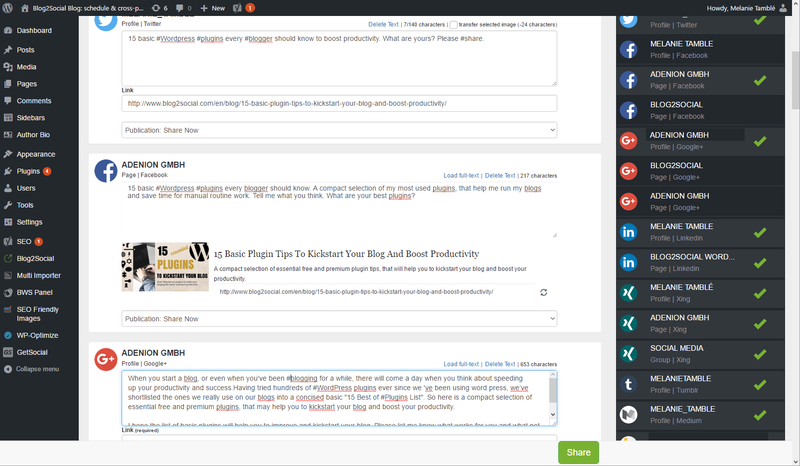 First thing you need to do is install and activate the Blog2Social plugin. Upon activation just go to the submenu Networks » to connect your networks. On the Blog2Social Dashboard you see all published posts. Select the one you want to share and click "Share on Social Media". You can also find the "Share" button in the editing section of each of your posts. Blog2Social offers you tow general sharing options, "Social Media Auto Posting" and “Custom Sharing & Scheduling” option with a variety of customization features to give you full control of your social media management. You will see a one-page preview for all of your connected networks, profiles, pages or groups. On the right hand side bar networks can be added or removed from your current sharing scheme. If you use the Blog2Social Premium you can also define different sets of networks for various sharing purposes. For example if you want to share to certain networks once and to others recurringly. Or, if you share various images with different comments, or whatever you like to do to promote your post more than once or with posts targeting different communities. You may just click the "Share" button on the bottom and all social media posts will go out to your networks immediately. Or, you may use the customizing options. The editor fields for each network are pre-filled with an excerpt of your post according to the number of characters allowed on each network. You may edit, add comments or delete the pre-filled text with comments, hashtags or handles. And you may schedule your posts for each networks. By selecting the Blog2Social Best Time Scheduler pre-defined times for each networks will show at the bottom of each post. You can edit all time settings, define your own as default times or add recurring time settings for individual posts and networks. You can check the time frames for the Best Times settings or define your own best time settings in the "Settings" submenu or you can simply edit the pre-defined times and save them as your own setttings. When you are happy with your posts and timings, you may also choose a selected image for your postings and click on the "Share" button to send or cue your postings for the auto-sharing process. Twitter: I add #hashtags to keywords. I also add @handles if I want to refer to a specific Twitterer for this post. Facebook profile: I add a personal comment to introduce my post. I ask questions or ask to comment on my post to encourage engagement. Facebook page: I edit my text for my business page slightly to give it a more formal touch. And I schedule it for a different time (the Blog2Social Best Time Scheduler does that automatically). Google profile: I add a slightly longer introduction for my post. Longer comments work better on Google and I use #hashtags for keywords. Google page: I take the same comment as for my profile, but I schedule it for a different time. Google group: I do the same as for my page. I often post to groups on different days. LinkedIn profile: I use the same comment as on Facebook or tune it even a bit more businesslike. I usually use the Best Time Scheduler to schedule my posts. I sometimes vary some of the suggested times, sometimes I add recurring posts for Twitter and for my LinkedIn profile. The customizing process for all networks takes me no longer than 5 minutes. If you're looking for new ways to manage the time to cross-promote your blog posts and cross-share your blog posts on multiple channels, smart automation will do the trick. 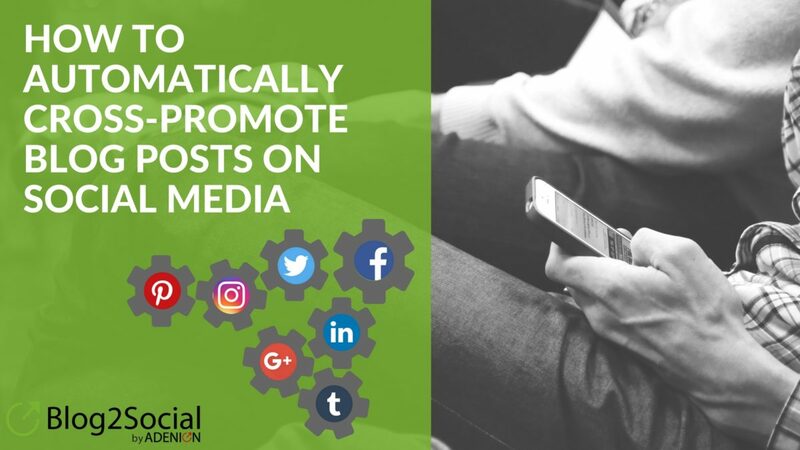 The plugin Blog2Social will help you to manage your social media cross-promotions smarter, faster and easier. It saves a lot of time and routine work and leaves more space for actually networking with your followers. Blog2Social is free for cross-posting and cross-promoting tailored posts to your social media profiles. For the scheduling and sharing option to multiple accounts, pages and groups it will be worth taking a look at the Premium version.